Last night was the official start of the European Songs of the Soul Tour in lovely Zlin, Czech Repuplic. Zlin is a relatively small town of about 50 000, but the welcome was huge and the crowd for the concert was 600+. Maybe it’s the proximity to the full moon, but it was one of the smoother and most enjoyable concerts I’ve had the honor of being a part of. I think the team is really getting it’s groove on. The technical people are working like anything and we’ve now done maybe 15 or 20 concerts like this one. I hope that this is a preview of what is to come for the next 8 concerts. I didn’t get a chance to hear everything but off the top of my head I think I Matthijs’ piano performance and Agnikana’s Group were stand outs for me. The finale with Gandharva Loka was very fun also. We played two songs and at the request (Standing O) of the crowd played a rocking (in the dynamic spiritual sense) third piece. The said crowd seemed to indeed be very appreciative. More posts to come (depending on Slovakian, Hungarian and Slovenian Internet). So from Prague we redistributed passangers and got into the same car to get to a meditation convention in Heidelberg (back in Deutschland). At the convention I put together a band of Austrian All-Stars for a very well received performance for over 500 people. Of course the journey from Prague had to start with a tire repair. That went fairly well, largely due to William (I call him Bill), our local Czech friend who found us a good shop and translated for us. We headed in the wrong direction out of Prague for a while but we soon corrected ourselves. At our first gas stop I was to take the wheel, but before I got anywhere the Czech Police stopped us and fined us for not having a proper highway vignette. We dealt with what was probably the nicest police officer I ever met. He checked all our passports and asked us what we were doing in Prague (1 Canadian, 2 Germans, 1 Italian). I told him about the statue and the museum where the inauguration took place. He knew the museum, the museum owner and told us about other interesting places to see next time were were in time. We also discussed ice hockey, of course. Our two countries being superpowers in the subject and everything. Unfortunately he had fallen on one of only a dozen canadian males who doesn’t really keep track of hockey. Anyway he gave us the smallest fine he could (500 Crowns) and said that he understood it wasn’t really my fault but that it was a little bit my fault because the driver is responsible for ensuring he has the proper docs for traveling. At that point I had driven about 30 meters from the gas pumps to the parking lot, but I was still the driver. Autobahn so driving 130 or 140 kmh. That’s when the German police pulled us over. My Berliner colleague said “Ah no! it’s only 100kmh here!”. Oops. When I got talking to the very nice mustache-wearing plain-clothed officer driving a ghost Audi, I asked if I was speeding and he said that we had only just crossed into Germany and that this was a border spot-check. I said “Ah this is the Deutschland Welcome Commitee!”. He smiled and said yes and asked for all our passports. We are apparently all clean so on we went on towards our convention. All was hunky-dory until we ran out of gas later. We were driving a former taxi that has a dual fuel system and I was quite confused with the different gauges. I thought that my German friends were keeping track, but apparently not. Fortunately we were only about 2km from the next gas station. Roger put on his running gear and headed off with an empty bottle of Volvic water. About 25 minutes later (good run Roger!) we had enough Benzine to get to the gas station. Once at the gas station Roberto was fuelling and I went into the store to see if there were chips to buy or something. After my browsing I headed back to the car only to see that a Polizei car had corned our car and an officer was questioning Roberto. I couldn’t believe it!! Upon seeing this I just did a 180 and went back into the store. What could I do, without speaking German? I could only laugh! Apparently we had been spotted on the side of the road and it’s illegal to run out of gas in Germany. Like it’s a really fun thing to do for most people! Roberto talked us out of it with our dual-gas story. So after this third police us 4 boys thought it was quite a hilarious day. By God’s grace none of the misfortunes ended up being too bad. We showed up a little late at our convention but with enough time to put together 2 (very) short rehearsals for our performance that evening. The band consisted of Usika on tampura, Kanala on sitar and guitar, Stefan and Thomas on vocals and myself on guitar and (my new) ukulele. 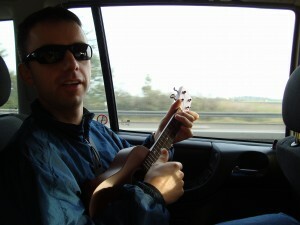 I love my new Ukulele by the way. The crowd seemed to really dig our performance and it was a small dream come true for me, because I have had in mind to play at one of these European conventions for some time. So the day ended well and the boys from the car thought that it was fun and memorable although we were happy it was over. But when we headed to our spot for the night, we were told that it was not quite over by the bright orange flash of a speed radar camera trap (or whatever they are called). Incredible! P.S. 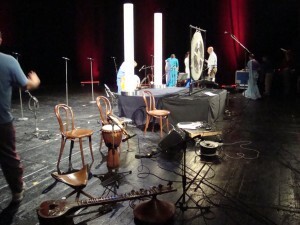 if anynone reading took pictures of the performance in Heidelberg, please send an email to info@pavaka.com. It would be much appreciated. Thanks! 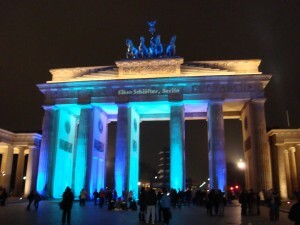 From Berlin, I got into a small van with 6 other berliners to head for Prague. On the way there we got a flat tire. Some of the boys pumped some white stuff into the tire so that we could make it to Prague. 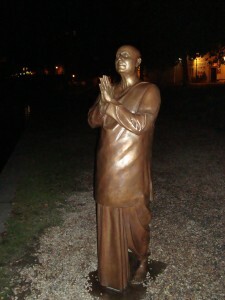 We were trying to make it to the inauguration of a new statue of Sri Chinmoy on the banks of the river. We had left Berlin a little late and with the tire, we in fact missed the said inauguration but we did see the fantastic statue by London artist Kaivalya Torpy. 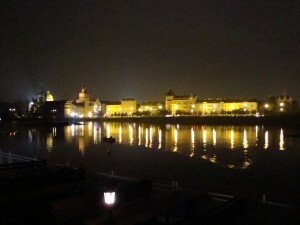 We did get a 2 hour boat cruise to eat and see Prague by night, though. Very cool. I guess it’s like a Paddlewheel Queen ride on the Red River back home in Winnipeg. Although, I have to admit, it seems so much less cool to me. I wonder if someone from Prague would think that a boat trip in Winnipeg would be as charming I thought Prague was. Of course your sights in Wpg were built between 1910 and 1980 or something like that while Prague was built, I don’t know, sometime around when Christopher Colombus landed in North America. After London, Berlin. The Gandharva Loka world music stores chain is opening it’s next chapter in Berlin in the coming weeks so I took the opportunity to check out what it’s like to be on the verge of opening such a shop. Sylka will be the manager in Berlin. This city is always so cool. I can’t quite put my finger on it, but the vibe just exudes zeitgeist – it reflects the spirit of the times. I was here a year ago but had no chance to see much. This time I also had little time but I did make it to the National Gallery, the Brandenburg Gate and other Berlin Wall-related sites. I really dug checking out the history of that city. It has lived through some of the most dramatic stories of the last century or 2. 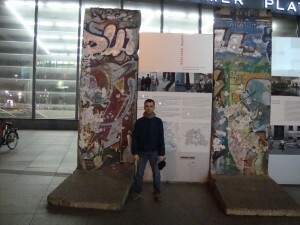 The people I met seemed to mostly be from former East Berlin\Germany. If you’re approx 40 yrs old or more, all your formative years were lived in communism. One lady that helped to renovate the new music store was telling me stories like how you could only buy 2 bananas per year and it was at Christmas time. She had 3 children, so she had to negociate with the man in order to get a third banana. He asked her to produce her passport which showed how many kids you had, and in this way she got the third banana. She said that there were good times during this period, but she wouldn’t want the Wall back. Maybe next time I’ll get to Checkpoint Charlie. I’ve been in London for a few days relaxing with friends and checking out the city. I really like this city. It really felt like New York this time around. Last time I was here was 1996. 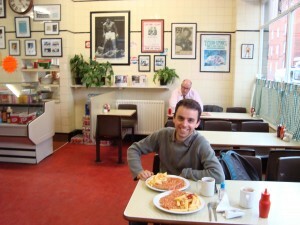 Here I am enjoying a great greasy spoon baked beans and chips (British to Canadian Lexicon: chips are fries and crisps are chips and country potatoes are home fries) on toast meal. Restaurants like these unfortunately or fortunately don’t seem to exist in Austria. The last time I remember enjoying a meal this much was 16 yrs ago having a cheeseburger platter after a week-long canoe trip. 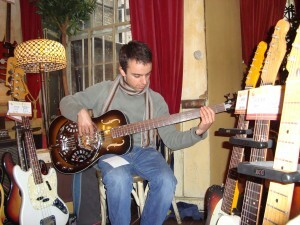 And here I am trying out a resonator 5 string bass in a very cool shop on Denmark Street (as recommend by Chris – Brit friend living in Salzburg). Pictures by Pavitrata with my little point-and-shoot camera. Just got back from a short visit to the south of France. The legendary French Riviera really is lovely. I had the good fortune to be able to play a little music for about 100 people gathered for a week-end meditation retreat. I got a group together with Czech, Slovak, Austrian and Irish boys in attendance. We played under the stars in the evening. Fortunately Sadanand, our percussionist, got his hands on a set of tablas at the last minute, thereby avoiding his having to play the pots we had in our kitchen (which actually sounded pretty good during the rehearsal). Next week I’m off to St-Petersburg for a few days. Hope to see the Hermitage museum and play a little music also. By the way, If you want to go to Russia, you have to have your visa issued in your country of residence. I had some adventures in that respect and if anyone can benefit from my complications, so much the better. Otherwise I’m basing myself in Salzburg. It really is a charming city that lends itself well to an artistic disposition. So much of the city is small pedestrian streets. It’s like stereotypical European charm; almost like it’s a caricature of itself for a North American such as myself. I wouldn’t be that surprised if one day I turn a corner and come face to face with Julie Andrews. In fact I do come face to face with Mozart frequently as his picture is ubiquitously present throughout the city. Salzburgers have definitely cashed in on their favorite son. And why shouldn’t they. As a great composer once told me: Mozart wasn’t a composer. He was a channel (for divine music). Vol. 2 is now available for online sales at www.CDbaby.com. You can click the link to your right to check it out. Let me know what you think. Write a review if you have a second. It all helps, I mean provided it’s a good review, of course More to come as the album becomes available in other places. Like once it’s up on iTunes, for instance. I recently did a Radio-Canada interview for the new album. You can listen here in French. I’ll try to post a transcription here in the coming days. Interview lasted 10 minutes and they played Eso Ma Durga. Otherwise I’m gearing up for a stay in Austria with stints in neighbouring countries next week. I’ll be gone for a while and will hopefully find time to use this here forum to post news about the trip. 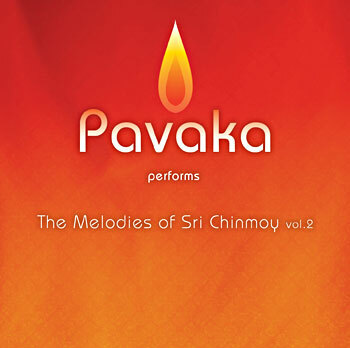 Vincent Dureault : What you are currently hearing, ladies and Gentlemen, is taken from the 2nd CD by Pavaka – The Melodies of Sri Chinmoy Vol. 2 and Pavaka has just been released in New York by the artist Pavaka also known in Manitoba under the name Stéphane Ritchot who has been living in Montreal for several years already. Stéphane Ritchot, hello and welcome! Pavaka Stéphane Ritchot : Hello Vincent! V : How are you? P : I am doing super well, how are you? V : I’m fine, thank you. Congratulations! P : Well thank you very much! V : You must be proud of you second project. P : Yes. It was a lot of work and I am happy that it’s finally available to the world. V : OK! 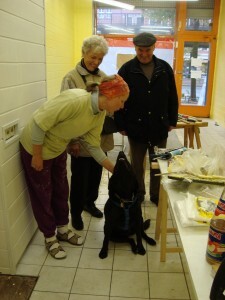 Stéphane, before we talk about this project, I would like us to talk a little about Sri Chinmoy. We know that he was born in India, he was a man who promoted peace in the world and the potential of the human spirit. I think he mostly did this from New York. He passed away in 2007. But I would like to know who he was for you. P : Well, I’ve been practicing meditation based on his teachings for the last 14 years now, something like that. One of the things he did was teach meditation to the public – free courses for the public, not always himself but his students like I became myself afterwards. So to begin with he was my meditation teacher. Since there were many other activities, it became other things, notably he is the person who wrote the melodies on this album we just released. V : So he was a guru for you, of course. P : Yes, you can say that. V : So you knew him personally? P : Yes, yes I had several personal interactions with him. He told me fairly often that I had quite a bit of potential musically so it’s something that I tried to develop over the years. But the first time he told me that, I had just played a little guitar and I had played very, very badly, in fact (laughter). I told myself that it must have meant something like – it’s something more profound. It’s like: I’m a good musician “inside”! (laughter) So I’ve been trying to express that outwardly also since that time. V : There you go! So you did the release of Volume 2 or the 2nd disc in New York last Saturday. Why New York? P : Thank you! For me, it’s a good way of going about it. Yeah, because at these conventions there are people from all over the world and it’s a good window for this sort of thing. V : And I see that you called upon Manitoban musicians to help you in this prokect. P : Well it’s from Manitoba that I come! P : It’s really an integral part of my musical background as well as everything else. Yes it was important for me to do that. So I worked with Daniel Roy and don benedictson among others, in Manitoba. And also with Joe Fiola who has been here in Montreal for a little while. Benoit Morier mixed the album and he is in Montreal also. Yes there is a strong Manitoban component indeed and it’s important for me. V : In fact, you even have Sacha Daoud who is percussionist with Chic Gamine! P : Yes sir! Now I can say that I have a Juno Award winner on the CD (laughter). P : There is Sacha and Benoit also of course who recorded Chic Gamine’s album. Yes I find that I am really well surrounded and there are other also more international people. There are people that I met in fact through the meditation center that participated. So there are people from Switzerland, Austria and New York that play on here. I thought it was really……I found myself very lucky to have been able to work with all these people. V : There you go! Are you possibly planning a release party for Manitoba at one point? P : I ran out of time regarding certain things that would be cool for a CD release and one of those would have been a Manitoba release. I thought of it – there are no plans for the moment. V : I see! In the meantime, for those who would like to buy the CD, how would you go about it? V : So she’s taking care of Western Canada and you’re doing the East! P : That’s right! (laughter) But otherwise it will be available for online download soon. I’m a little behind on that, but it will be available on iTunes and Napster, things like that, soon. I think we’ll have some at La Boutique du Livre also in Winnipeg. V : Understood. Stéphane Ritchot, are you targeting a particular market with this CD? P : Well I’m targeting…I mean, the gap I’m trying to fill ….It’s kind of like new age music in the sense that it’s something that comes from meditation music so it’s a mellow-new-age style but on the other hand I’m making it into a kind of pop or jazz that I hope is interesting to hear. To quote Francois Pérusse (French-Canadian comedian) I want to NOT sound like “someone who fell asleep on his keyboard and turns over from time to time”! (laughter) What I want to do is give people music that has a particular kind of consciousness, that has a vibration, a feeling of meditation but sounds like, not ordinary, but what I mean is something that is familiar to the Western ear, I would say. P : So that’s what I want to do. And also it’s music you can listen to in the car without falling asleep that will have an interesting consciousness. In general for me that is what is interesting about this project. All music has a kind of consciousness, of feeling behind it. It’s a vehicule for something. For me, taking the melodies of a spiritual master essentially is something very fresh. It’s something that doesn’t exist much in the world and it’s something that I hope will fill that gap. I don’t know exactly what the audience will be but it’s kind of part of the experiment – to see who will react and how they will react to this. V : Remind us why you chose “Pavaka” as a stage name. P : It’s also a spiritual name. The meaning, in essence is ” pure heart, clear mind”. And the principle of having a spiritual name is that it represents an ideal towards which you are moving. So it’s something that I was using in certain contexts for my meditation practice and I figured it would be a good stage name also. V : Stéphane, to finish, we will listen to «Eso Ma Durga». V : Can you present it for us? P : This is a song that I did with..the only that I did with Shawn Sasyniuk. He is a Franco-Ontarian drummer who lives in Montreal. I know him from his work with Anique Granger but he’s a hot-shot in general. He plays with Roch Voisine and other A-List performers in Montreal. P : That’s the foundation. There is a sitarist -that’s another word I think I just invented. V : No I think that exists. P : A sitarist is a real word? P : Incredible! Fantastic! 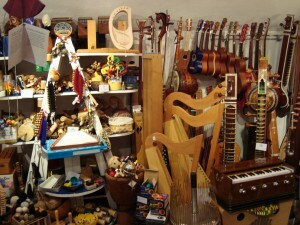 (laughter) There is a viennese sitarist and that’s it. This song was on the first CD but as an instrumental. This one has vocal on it, and yeah, I tried to do something mellow and interesting. V : Well, let’s listen to it right away and in the meantime, Stéphane Ritchot alias Pavaka, I thank you very much and I wish you enormous success with this nice project. Thank you very much Stéphane! P : Thank you very much Vincent! Having spent his life savings on the recording of “Vol 2”, Pavaka S. Ritchot has not been able to hire a press secretary as was initially hoped. This reporter has learned that in the face of such dire PR circumstances, Mr. Ritchot has resorted to taking care of his own marketing and publication. Writing blogs, posting news stories and answering fan mail all on his own. At the time of posting, in fact, this reporter is realizing that his compensation for the present story is likely to be little more than good wishes and possibly a Tofurky sandwich. Therefore there is little left for this reporter to do but to wish one and all a good night and good luck. On Saturday August 22 was the official release of the second album by Pavaka. The Melodies of Sri Chinmoy Vol. 2 is officially out there for the world to hear. After considering ideas such as “launching” CD’s in a model rocket into low orbit, and “releasing” CD’s from small CD cages, the marketing department opted for a more traditional short concert followed by sales of the CD to the patrons. The said concert took place at the Panorama Café in New York to a very appreciative crowd.. For more info on buying a copy of the CD, use the email form in the About tab of this website. Online sales will soon be available. Stay tuned.